Operations can be planned, but in actuality, special units are often surprised by new situations. This is exactly what this Instructor Course is based on: new situations / various dangers. Thereby teaching students to adapt to occurrences in the field. The French ex-police officer is a Krav Maga expert with over 30 years experience of training and education including police and military instructor and travels around the world as a professional bodyguard and holds lectures on anti-terror tactics. 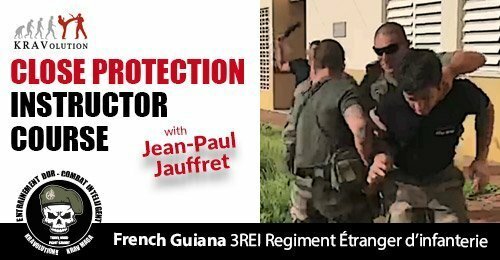 Jean Paul is also the head of the KRAVolution professional Section for Law Enforcement and Military Education and Tactics. ADMISSION REQUIREMENTS: This Krav Maga Instructor Course is available for members of the military and law enforcement as well as certified Krav Maga instructors. This course offers the highest level of training for military and law enforcement members and our goal is to produce quality teachers, who can train their own units. There is no need for prior experience in Krav Maga.